Here are a few short free tutorials covering various aspects of playing jazz. Click on each of the topics shown in red and a pdf file will appear. To zoom in, hold down ctrl and tap + and to zoom out again, ctrl and tap - . To turn the page click on the forward and backward arrows on your keyboard. To print them, go to File and then Print and select either "all" or "current page". If you have an old printer, remember to set the print quality to high. Use the back arrow at top left to return to tutorials page in Internet Explorer. BASICS - key signature, time signature, chord-building (triads), inversions, intervals. CYCLE OF FIFTHS - key signatures of major and minor keys, cycle of fifths. SWING FEEL - triplet feel, notation, smoothness, accents. STRAIGHT 8's FEEL - as applied to ballads, latin and rock. MOTIFS - motifs, ways to develop a motif. 6 9 CHORDS - major and minor 69 chords, major and minor pentatonic scales, chords built from pentatonic scales, blues scale. PEDALS - concept of consonance and dissonance, pedals in the bass, pedals on top of harmony. MAJOR AND MAJOR MINOR SEVENTHS - a few things about these chords. DOMINANT SEVENTHS - how to construct, the names of notes, inversions of dominant sevenths, resolution of the notes, purpose in modulation, general use. ALTERED CHORDS - 5ths and 9ths altered in dominant sevenths, altered major chords, altered notes in half-diminished chords. AUGMENTED TRIADS - construction of augmented triads, uses, whole-tone scale. THE DIMINISHED - diminished chord, diminished scales, substitution. THE HALF-DIMINISHED - half-diminished chord, scales to use over it, substitution. VOICINGS - different registers, relative strength of different intervals, quartal harmony, things to avoid, close-position harmony, open-position harmony. TRANSPOSING - general tips, spotting II V I and I VI II V progressions, checking for ascending and descending chord progressions, intervals, ear-training, Eb transpositions. 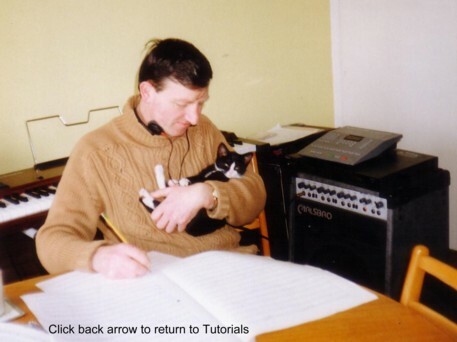 HARMONISING A MELODIC LINE - more advanced diatonic approach, using triads and their inversions, chromatic approach, using major, minor and augmented triads, Shearing sound, diminished chords, open voicings, fixed interval chord progressions. MINOR SEVENTHS - a few things about minor sevenths. HIDDEN SCALES - finding scales which apply to unrecognisable chord symbols. CHORDS FROM SCALES - building chords from scales and using them in improvising. CHORD PROGRESSIONS - common chord progressions, substitute chords, writing new progressions. BASS LINES - how to construct bass lines for various changes, chordal notes, scales, broken-up feel. SCALE-CHORD RELATIONSHIPS - the main scales used in jazz, scales to fit chords, general points about improvising. PRACTICE - how long and when, perfectionism or not, creativity, routine, technical exercises. RHYTHMIC PATTERNS - some different rhythms to liven up your practice sessions. GIGS - problems on gigs and other difficult situations. A DRUMMER'S GUIDE TO BIG BAND MUSIC - how arrangers write music for drums and what is expected of the drummer. HINTS ON COMPOSITION - on style, melody, harmony, rhythm and form. See also the Projects page. HINTS ON ARRANGING - on style, harmony, melody, instrumentation and other points. See also the Projects page. THE RHYTHM METHOD - new ideas for rhythmic patterns. FILLER-NOTES - notes used to fill in a line. MELODY - melodic elements in tunes and in jazz phrasing. THE BLUES SCALE - need I say more? OPEN-HEART BRAIN SURGERY ONLY JOKING! - what you will eventually need if you persist in playing jazz. FOREIGN NOTES - notes which can be used which do not form part of the scale. COMPOSITE SCALES - hybrid scales which are a combination of 2 normal scales. THE MOST ESSENTIAL THING NEEDED TO WRITE MUSIC - as recommended by all the greats. THE HARMONIC MAJOR SCALE - the scale and chords which fit it. HARMONIC MINOR (b2) SCALE - the harmonic minor scale with a flattened second note. PLAYING BY NUMBERS - free playing within set limits. To hear how this might sound, click here. This is the example given on page 3 to which I've added a bass. FORM - how music is put together. THE ORIGIN OF PIECES - the evolution of a piece. and make a point of listening to live jazz whenever you get the opportunity. So make your choice now by clicking on one of the names. The "Instruction Manuals" are given below. ...the minipianos won't work. But there is an easy solution. Download the extension, IEView (Click on Tools/Extensions/More extensions/IEView.) Exit and re-enter Firefox. Go to the minipiano you want, right-click and choose IEView. The page will then load in Internet Explorer. To get back to Firefox, click on the icon at the bottom of the screen. The notes will sound whenever you pass the mouse over them, whereas the chords need to be clicked to be heard. This makes it easier to avoid playing wrong chords. If only life was always that simple! To get a legato feel, move the mouse a short distance away from the keyboard (under or over) and then go to the next note. Moving directly to other notes results in a more stacatto sound. Lesson over. When they're not looking insert a CD of Art Tatum / Oscar Peterson / Bill Evans / Chick Corea, etc. into your computer. While it is being played look very intense and move the mouse frantically over the keyboard and chords. The CD must drown out any other sounds. (Try not to pick a CD with bass and drums on it, as this might take some explaining.) The important thing is to look VERY VERY intense, like jazz players look in the movies. With any luck you might get a pay-rise or an extra bottle of milk, and your kids might even call you "wicked", even if it's just to wind you up. Scored Changes Explained.- you can use the last page to determine which scale could be used over a chord or to write your own scored changes charts. If you find these articles useful or otherwise, let me know. You can put them into practice by downloading some of the tunes on the other pages.